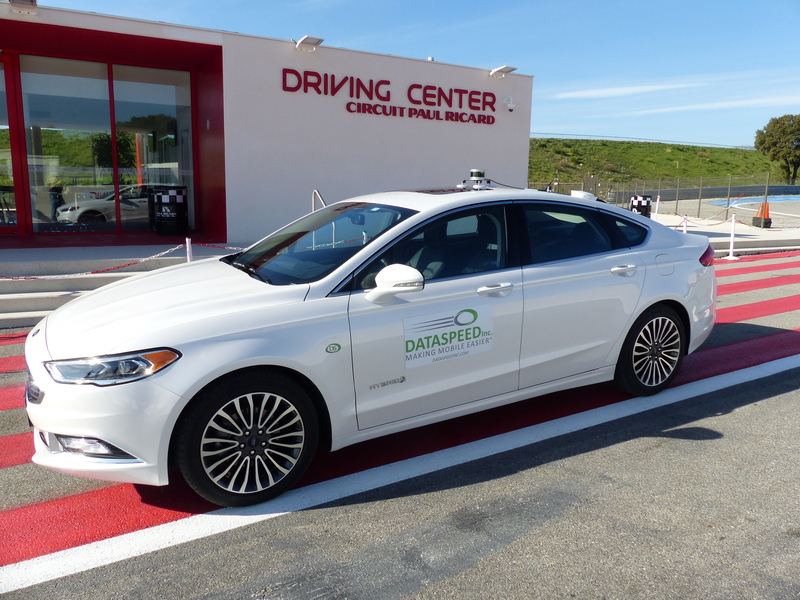 Dataspeed Inc. was recently in France at the Paul Ricard Raceway demonstrating the different ways the ADAS Kit can be used in autonomous development. The different methods they demonstrated were remote control, and autonomous path following using 3D LIDAR SLAM, and precision GPS. Dataspeed began the demonstration by showing the capabilities of the ADAS Kit by mapping the brake, throttle, steering and shifting controls to the buttons and joysticks of a typical video game controller. This showed the simplicity of the interface to the vehicle, and how easy it is to transition between manual and computer control. Dataspeed’s presentation continued with a demonstration of their custom SLAM algorithm (Simultaneous Localization and Mapping) using a Velodyne VLP-16 LIDAR. The VLP-16 LIDAR provides 3D scans of the surrounding area, generating half a million data points every second. Each of these data points is an (x, y, z) coordinate of where a laser beam has reflected off an object. Dataspeed’s SLAM algorithm compares the currently received point cloud to ones it received in the past to detect how much the vehicle moved and rotated since the last observation. Using these relative motion computations, a global map is gradually built as the vehicle moves around its environment. The algorithm also estimates the position and orientation of the vehicle. After a map is built and saved, the algorithm operates in localization-only mode, where it doesn’t add information to the map, but instead uses the current point cloud to figure out where the vehicle is on the map. Dataspeed demonstrated how their ADAS kit can be used to implement autonomous driving algorithms by first manually creating a path where both the position and speed are recorded. Once the position and speeds are recorded, the car then follows the path by itself, tracking the same speed as the human driver. The position recordings come from the localization estimates (position and orientation) indicated by the SLAM algorithm, and the speed recordings come from production vehicle CAN bus data. Dataspeed’s presentation concluded with a path following demonstration similar to the previous one that used SLAM for position recordings. In this case, high-accuracy RTK GPS was used for the localization estimates. Once fully initialized and calibrated, an RTK GPS system is able to estimate the position of the vehicle with an accuracy of 3 cm. Instead of recording the position relative to the beginning of the SLAM map, the recorded path positions were the vehicle’s GPS coordinates. The same path following control software was then used to guide the vehicle along the recorded GPS path. Ready to take the next step and invest in the future you’ve always dreamt about? Contact us today.